Do you have Massachusetts ancestry? Barbara J. Mathews, CG, President of the Massachusetts Genealogical Council, alerts us to Massachusetts Senate Bill 820, which will close all vital records after 1841. Yes, that is not a typo: 1841. S820 states that only the person named in a vital record or his parent, guardian, or attorney can look at a record or get a certified copy of a record. This law applies for records all the way back to 1841, that is, to all the birth and marriage records for the last 169 years. We cannot ignore this bill. Please write to members of the House Ways and Means Committee right away to stop this bill from moving forward. Massachusetts is an open records state and has been so since 1641. To access a list of the Massachusetts House Ways and Means members, go to http://www.mass.gov/legis/comm/h34.htm. From the committee listing, you can click on the name of any member and go to that member's personal page. Full contact information is on the member's page, including telephone, mail, and email. Put "Against Senate Bill 820" in the subject line of your email. Genealogists, protect your interests! My grandfather keeps trying to get my attention about his military record, which I had ignored for too long. About a month ago I reviewed some of my father’s genealogy files for examples I could use in my lectures at the upcoming NGS Family History Conference in Salt Lake City, Utah, 28 April – 1 May 2010. A newspaper article from the Rockford (Michigan) Register dated 16 June 1966 caught my attention. It was the 50th Anniversary of Rockford Guardsmen in “M” Company, Grand Rapids Battalion, 32nd Michigan Infantry, serving in the Mexican War. The article included a photograph of eleven men with rifles. My grandfather was one of the men in the back row. I sent an email to my uncle Neill to ask him if my grandfather ever mentioned serving in the Mexican War. His response was “Dad NEVER mentioned military service of any kind. Sorry I can’t help.” My uncle went on to mention that he had been to Pancho Villa State Park in New Mexico some years back, where most of the military were stationed during that time. Grandpa's visit to Pancho Villa State Park could be a significant clue to his service. Mexico's internal revolution began in 1910. In 1913 U.S. President Taft stationed troops along the Rio Grande to protect Americans in the area. When Woodrow Wilson became President, he increased the U.S. forces - and Mexican resentment as well. From Mexico's 1915 election rose Francisco “Pancho” Villa, who was loved by millions of revolutionary supporters and hated as a ruthless bandit by many others. Villa's exploits along the border caused the U.S. to organize a punitive expedition of about 10,000 men, but they never managed to capture their quarry. At the same time, European troubles were escalating into a world war; in early 1917 the U.S. troops were redirected, and the U.S. negotiated better relations with Mexico. I put the newspaper article in my pile of genealogy materials to take back to Michigan this summer for further research, along with the notation, "Check Michigan National Guard records 1915-1917." A few evenings later I picked up the New York Archives, Winter 2010, Volume 9, Number 3, which had recently come in the mail. 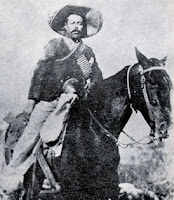 The cover included two soldiers in uniform with the caption “Keeping Out Pancho Villa.” The article, which began on page 13, mentioned that “over 100,000 National Guard troops were activated to patrol the American side of the border” to keep Pancho Villa and the Mexican rebels from raiding New Mexico border towns. If my grandfather had indeed served along the border in 1916, this article provided more details about their living conditions and duties. Most of the soldiers never encountered the rebels but suffered from the heat and disease. This week I received the January/February/March 2010 issue of Michigana, published by the Western Michigan Genealogical Society. Page 31 included a list of the Michigan National Guard companies in the 33rd Regiment that were deployed in the Mexican Border Campaign on 19 June 1916. My grandfather’s company and regiment were not listed, but this article was part three of an earlier series of records compiled by LeRoy Barnett, Ph.D., who had served as a reference archivist at the Archives of Michigan. Copies of the earlier issues are at my Michigan home. One article would be a coincidence. Three articles have definitely gotten my attention. So Grandpa, I hear you. I promise more research this summer on your Mexican War service in 1916 and to write and share your story with the family. The first stop will be the Archives of Michigan. the fall of 2011; the exact date is yet to be determined. Many of the records will be kept off-site. on May 4th at 10:30 AM and at 5:30 PM at the Alexander Hamilton US Custom House at One Bowling Green in New York City. Questions about the move should be directed to Nancy Shader, Director of Archival Operations at NYC NARA at [email protected]. We are considering moving from the Varick Street federal office building to the Customs House, a federal building in lower Manhattan that also houses the Smithsonian American Indian Museum, which draws 300,000 visitors annually, and is centrally located near the Ellis Island and Statue of Liberty ferry landings. A feasibility study is currently underway. Because of the high cost of archival storage in Manhattan, we plan to move eighty percent of New York City holdings to our Federal Records Center (FRC) in northeast Philadelphia in a new archival bay. The most heavily used records and significant “treasures” from the holdings will remain in New York. Our paper forms for the 2010 census are being processed by very high speed optical scanners, which create a digital image of our forms exactly as we filled them out. Those machines also create a numeric data record that is used for the statistical aggregation of answers from all persons in the census. One decision we had to make was whether to save both the numeric data record (for statistical purposes) and the digital image (to aid the genealogists of the future). We've decided to save the digital images and transfer them to the National Archives for safekeeping until 2082. 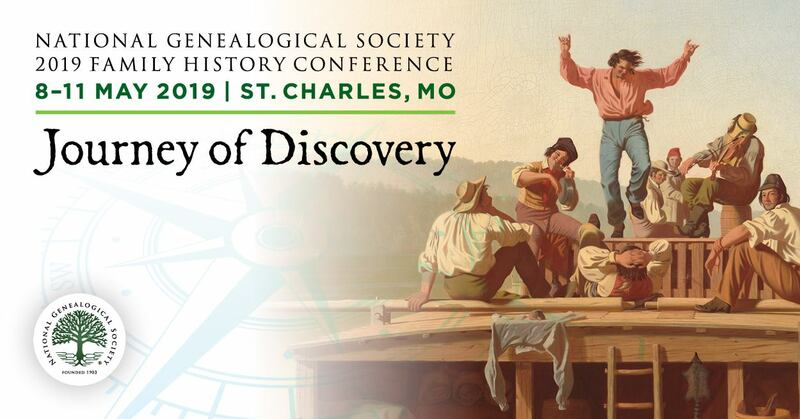 You won't want to miss the opening session of the National Genealogical Society’s 32nd Family History Conference, “Follow Your Ancestral Trail,” in Salt Lake City, Utah. Be sure you're at the Salt Palace Convention Center on Wednesday morning, 28 April 2010, at 8:00 am. The keynote address is the premier of a video tour that provides a behind-the-scenes look at the world-famous Granite Mountain Records Vault. In addition, you may be the lucky winner of a seven-night stay at the Salt Lake Plaza Hotel at Temple Square, courtesy of the Salt Lake Plaza Hotel, which is right next door to the Family History Library. All full-conference registrants will be entered in this drawing, but the winner must be present at the opening session to claim the prize. The opening session at this year’s conference will be held on Wednesday morning, 28 April 2010, at 8:00 am. The keynote address is the premier of a video tour that provides a behind-the-scenes look at the world-famous Granite Mountain Records Vault. FamilySearch stores microfilmed and digital genealogical information at this archival facility located in the mountains outside Salt Lake City. This secure facility was designed to protect the collection of genealogical records from decay, natural disasters, and manmade calamities. The vault includes 65,000 square feet of space carved 700 feet into the side of a solid granite mountain. The climate in the facility is carefully controlled to maintain optimal storage conditions for the records, which represent 100 countries and 170 different languages. The Granite Mountain Records Vault currently stores approximately 3.5 billion images on 2.4 million rolls of microfilm, plus nearly a petabyte of digital data. And there is still room for growth as FamilySearch continues to preserve and share the records of the world. The vault is not open to the public, so conference attendees will be treated to something they cannot see in person. Following the video, Jay L. Verkler, president and CEO of FamilySearch and managing director of the Family History Department of the Church of Jesus Christ of Latter-Day Saints, will continue the tour with an exploration of trends and resources that will enable these and other records to be viewed worldwide. Register for the conference today! NGS members get top discounts, so this is a great time to join. Registration details and the conference program can be found online at www.ngsgenealogy.org/cs/attendee_registration. As you may know, the idea for Who Do You Think You Are? originated from a phenomenally successful show in the UK, which has traced the roots of some 50 individuals in the last 6 years. During the last season, more than 5 million viewers tuned in to watch the UK show. Nearly 12,000 Brits attended the Who Do You Think You Are? Live conference in February 2009. Of those, 84 percent say they started researching their family history since 2004. 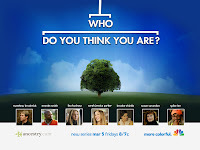 The show has generated a surge of family history interest in the UK – and the U.S. version of Who Do You Think You Are? could result in the same reaction. Throughout these next few weeks, it will be exciting to see America’s reaction to the show!